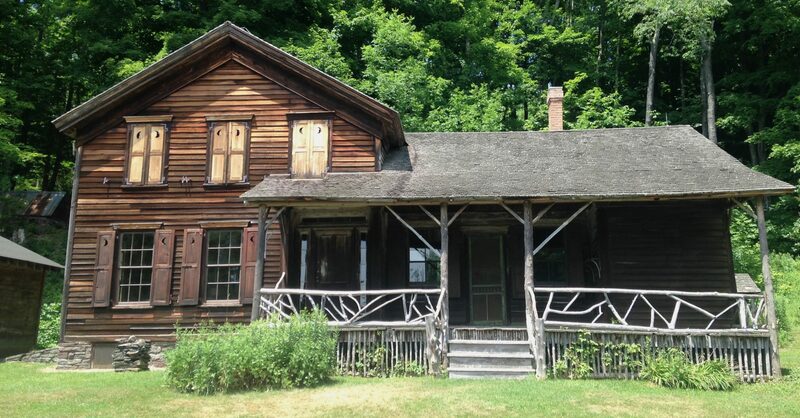 Anne Richey, a docent at Woodchuck Lodge and local teacher has published an homage to the works of John Burroughs in the form of an eclectic collection of poetry and prose: an anthology of notes, quotations, prose, excerpts from an ancient diary and “found poetry”. Chapter 1 begins with a quotation by Thoreau “Talk of Heaven! Ye Disgrace Earth” and starts as it means to go on. 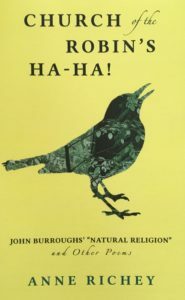 “I believe God is nature,” John told a friend. “Every day is a Sabbath to me”. Burroughs lived in a time when the Catskills were almost wholly deforested by loggers and tanners and it affected his outlook deeply. As Anne writes: “His parents’ Calvinist preoccupation with the heaven to come seemed to him tragically misguided and counter-productive”. Although Anne has stated that she spent several years researching Burroughs’ religious views to discover: “one thing I admire about John is that although he had no use for organized religion, he did not begrudge his parents, or anyone else, the comfort they found in their faith”. John Burroughs had what Anne describes as an “essentially religious connection to nature. For the famed naturalist and writer, ‘heaven on earth’ was no mere cliche, but a reality”. “You know how visual artists go around gathering scraps of whatever: plastic, metal, paper, etc and arranging them in a compelling way? Some poets enjoy gathering words or lines from outside sources like newspaper articles or ads or graffiti and then arranging them to create something meaningful in a new and/or beautiful way. In the case of “Speckled Trout,” I wanted to compress key ideas from John’s long-ish essay of the same name, so I took exact lines from the first few pages and put them together in a way that conveys John’s religious sense of both intimacy and awe. I wasn’t so much trying to make something new as to reveal an essence. I did the same thing with Katherine Scudder’s 1899 diary. I was charmed by the innocent wary flirtations between the girls and boys she mentions, not to mention the general simplicity of her daily life. So I excerpted and arranged certain passages to highlight those things. (Also, I got a kick out of the fact that she kept a regular tally of the number of hat-tips she got from men. I’ve asked people if that was a thing for girls back then, but so far, no one seems to know). Richey will talk more about the book in her radio interview with J.N. Urbanski on WIOX 9am on Monday August 20th. Anne will be reading her work and discussing it on Saturday July 7th at 5pm at the Woodstock Library Forum.